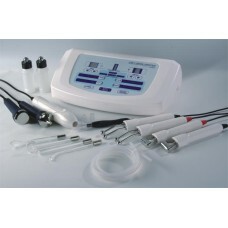 Dear buyers, we offer you to consider a great cosmetic combine “4 in 1 AS- 4503”. This small device can bring extra income to your business and increase the flow of visitors by increasing the level of your service. This perspective device can perform the function of a vacuum spray, a darsonval, an electroplating, a phonophoresis. We believe that the compact size, a great efficiency and reliability will develop you as a cosmetologist or develop your business in general. You can easily transform faces of your customers, so professionally and quickly that they will wish to use your services again many times. Presented combine can easily clean up pores of the skin, remove the "annoying" acne, saturate the skin with oxygen. With this original device you will have the possibility of providing procedures, which are often performed by your fellow physicians. Increase your skills and experience with new proposals of our website!